Before I started blogging, I would never have thought about making a gingerbread dough or any dough and leaving it for 2 months in a fridge. Well, that sounds scary, doesn’t it? I kind of know what am I doing now just by a simple fact, I tried a similar recipe for maturing gingerbread cookies 2 years ago, it wasn’t exactly the same recipe, but the idea was the same. It turned out nice. So this year I’m making maturing gingerbread, and I hope it will turn out nicely. Otherwise, it will be kind of annoying not to have an epilogue to this post, won’t it? If you want to join me in making this cake, you need to start your dough as soon as possible as it needs to sit in the fridge for next 6 weeks. 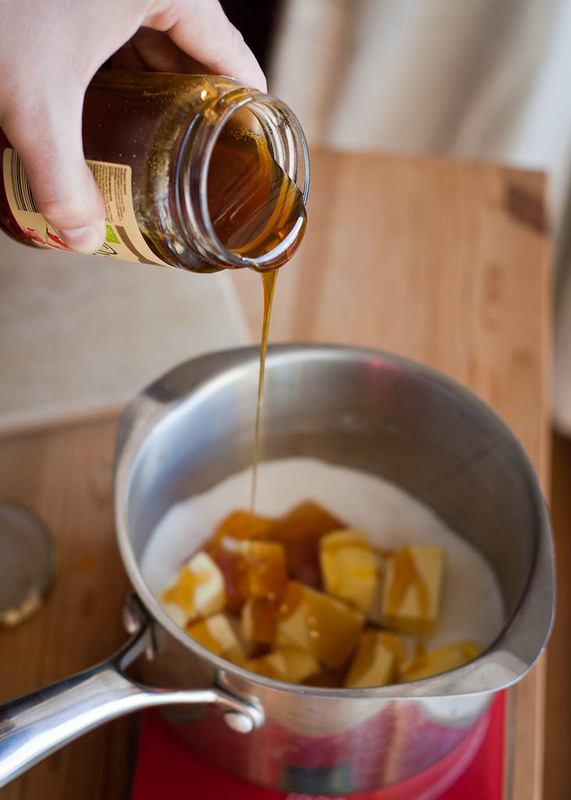 Mix honey, sugar, and butter in a saucepan, until the mixture will start to simmer and sugar will dissolve entirely. Add flour, milk and baking soda mixture, eggs, salt and gingerbread spice mix. Knead the dough until smooth. It will be quite sticky at this point. Place the dough into a glass container, cover with tea towel and store in a fridge for 5-6 weeks (only 2 weeks will do as well). Divide the dough into 3 equal parts and roll it out into even rectangles about 0.5cm thick. (you may need to leave it first in room temperature for an hour, as the dough hardens during maturing and maybe a little bit difficult to handle). Preheat the oven to 170ºC/160ºC fan. Place the first gingerbread layer and cover it with the half of the plum jam. Place the second layer and cover it with the remaining jam. Place the last layer at the top. Wrap it with parchment paper, put something heavy on the top like a wooden cutting board and leave for 3-4 days to allow flavors to mature. Cover the cake with icing or chocolate ganache. Posted in Cakes, Christmas, Polish food and tagged Christmas cakes, gingerbread spice mix, honey. Bookmark the permalink. Really? Do you have any recipes? How did you like them? Was it worth it? I have a Danish friend, but I haven’t heard about maturing cakes, only standard cookies. Thank you for the recipe and thank you for writing it in metric! :)###<=? I presume your cup measurement is 1 cup = 250 ml. Is it? I’m making all 12 dishes this year, and I’ve been discussing the two rival gingerbread opinions with some of my students. The predominant view is that the gingerbread is baked and then stored for ages beforehand. I’m a little wary of that, as I associate that more with fruitcakes like traditional UK Christmas cakes. I’m going to try yours, with the rival strategy of storing the unbaked dough for a few weeks, instead. I’ll let you know after the 24th of December how it went. Thanks again for the recipe. Oh wow. Good luck David. That’s a nice challenge. Gingerbread stores really well, and especially when it comes to gingerbread cookies it is recommended to bake them a few weeks before Christmas so they have time to soften and develop their flavours. As you will layer the gingerbread with jam it will need less time soften. By the way, what oven temperature should I use? I can’t find one in the recipe. Good catch David. I’ve added in. You should bake in 170ºC/160ºC fan. Hello, Magda! I love traditional polish ginger bread cookies, but it’s a rear treat here in the states. I tried some recipes before but all of the resulting products were just regular cookies.. this post offers hope 🙂 you said you made ginger bread cookies before, did you post that recipe? or do you think i could use this dough for cookies? Btw did you have pictures of this cake? I want to make gingerbread cookies probably over the weekend. So far I didn’t post any recipe. I want to try ones that you can’t eat straight away and you don’t have to wait. I hope they will turn out lovely and I can post them on the blog. Yes, you can use this recipe to make cookies, just remember to bake them a few days before you plan to eat them as they maybe very hard at first. Yes, I do have a photo of the cake, I will add it to the post in few minutes. Oh my god it looks professional and so good! Thanks for the recipe and the picture! Will be checking back for the Pierniczki recipe 🙂 I wish I could pay back with a recipe or 2 but I am a dummy. Aww thank you Galia, but it’s actually really easy to make it look professional, as you can to cut the edges of the cake. I think I saw that blog, my favourite Polish blogger used some of recipes from there. I will have look anyway 🙂 Good luck with pierniczki, let me know how it goes. This gingerbread looks incredible… and the layers are seriously perfect! I can imagine it tastes delicious too, pinned! Just made the dough! So exited! Have a couple questions here. So.. my dough is a little too spicy.. like a little too gingery.. does the flavor stays the same over time or does it change?It smells awesome and the color is great but I am afraid that the spices are not exactly what they were supposed to be.. And another question how did you keep the towel on place? did the dough dry out on top? Wow this recipe is unbelievable really! Did you added more spices? Or they were super fresh? I don’t remember how my dough did taster when it was fresh, but the flavours should blend together while the dough develops. You can always put the rubber around the towel to make it stay in place. I had the dough in the drawer and the towel just stayed on the top. Yes, the dough will get very hard and it will dry out a little. I’m glad you like it 🙂 I just hope you will like the end result. They turned out really good! I used apple butter(no sugar – quite sour) for the filling and melted dark chocolate for covering, delicious! Melt in the mouth! My friends didn’t believe that I made them 🙂 Btw I used pirogy maker and it works great. Will make them again next year. Thanks, thanks, thanks for sharing! I’m so happy for you Galia. Those are the best moments of blogging. Have a great New Year! What do you recommend for the gingerbread spice mix? Can you tell my about how much of each spice? I’m assuming ginger, cinnamon, etc.? Also, I see more than jam in one layer! What is it? Thanks! I often use this recipe. You will get best result by using whole spices and grounding them just before mixing it together. This makes a quite big portion, so feel free to divide, or skip some spices if you don’t have them. Can you use this recipe just to make biscuits (cookies), without doing the layering into a cake and jam etc.? Yes, you can make cookies with them. If you have time you can also stuff them with jam. Take a look at photos on the blog http://www.mojewypieki.com/przepis/pierniczki-nadziewane. Thanks Magda, they look great! I’ve just made a batch of dough up for a test run in a few weeks time. I’m definitely going to put jam in them, and I love the idea of spraying them gold! Hi I’m a retired teacher living in Poland and I enjoy cooking. Thank you for the gingerbread recipes but also for your site which I think is excellent . You have chiosen your recipes well, I trust them and will be back for more . Wszystkiego dobrego w nowym roku. Thank you very much for the recipe. For the last two Christmases, 2014 and ’15, I have made all twelve dishes for visiting members of my family. Your gingerbread recipe was a resounding success. Magda, how many cookies does this recipe make please? Sauv, I must say I don’t have a clue. I only made a cake from it. I think the pan I used was 20x20cm and you get three thick layers of gingerbread. Hope that helps. Sauv, I don’t have a clue, I only made a cake out of it. Can this recipe be used to make cookies, too? Yes. I’ve never done it, but I know others do it.